As a young girl in Kenya, Wangari was taught to respect nature. She grew up loving the land, plants, and animals that surrounded her -from the giant mugumo trees her people, the Kikuyu, revered to the tiny tadpoles that swam in the river. Although most Kenyan girls were not educated, Wangari, curious and hardworking, was allowed to go to school. There, her mind sprouted like a seed. She excelled at science and went on to study in the United States. After returning home, Wangari blazed a trail across Kenya, using her knowledge and compassion to promote the rights of her countrywomen and to help save the land, one tree at a time. 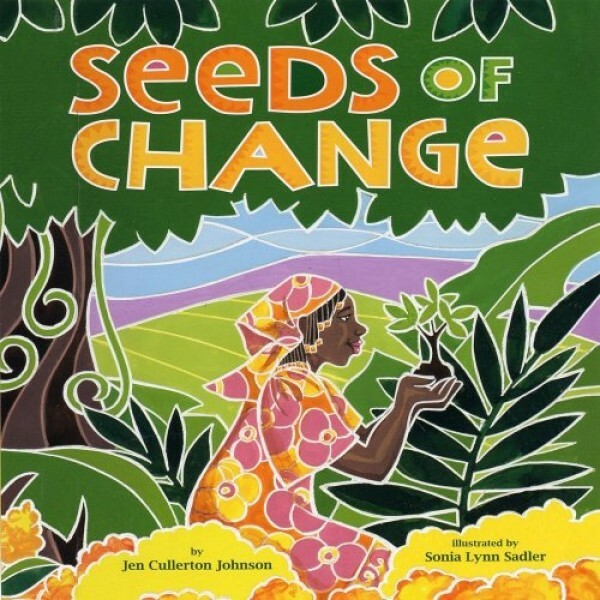 Seeds of Change: Planting a Path to Peace brings to life the empowering story of Wangari Maathai, the first African woman and environmentalist, to win a Nobel Peace Prize. Its engaging narrative and vibrant images paint a robust portrait of this inspiring champion of the land and of women's rights. For more about Wangari Maathai, visit A Mighty Girl's Wangari Maathai Collection.